DUI Journey, Detailed steps of the dui process. 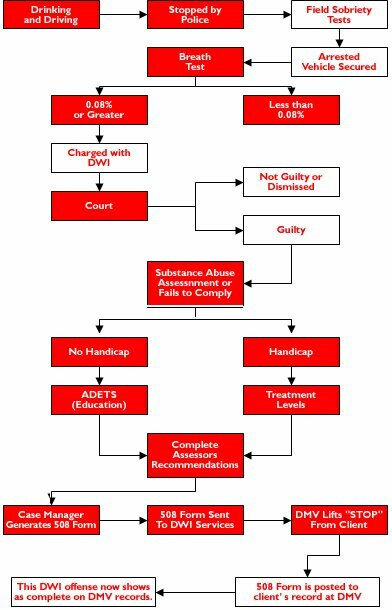 Below is a graph of the DUI journey process. It guides you through all the steps involved in getting a DUI. From when you are stopped by the police, until the DUI is shown as complete on your driving record. We understand that getting a DUI can be a very stressful time in your life. Below are the experiences of others who have went through a DUI and have shared their story. Would you like to share your DWI journey? We would love to hear about your experience and how this process has affected you. You can post your story below, and read what others have to say about getting a DUI. We are interested in learning about your experience! Getting a DUI conviction is often expensive and embarrassing. We understand what you are going through, and you are not alone! Sharing your experience, and reading about others, can help you feel better about making it through this DWI journey. "I had a DUI in 2011 and my other car insurance went sky high for dui insurance. Ashlee from the Raleigh office contacted me with a quote and I was so surprised and pleased at what she told me.